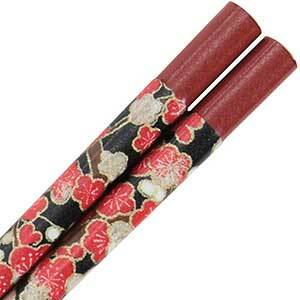 Japanese Washi paper chopsticks have traditional ornamental paper laminated to wooden chopsticks. These fine crafted chopsticks are perhaps the earliest predecessor to modern mass-produced chopsticks that have decal or "heat-stamp" designs. This style dates back more than 1,000 years. 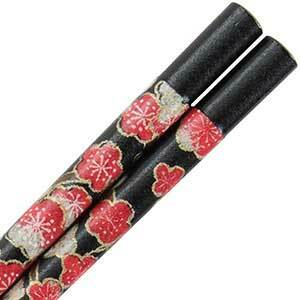 Washi is the traditional Japanese craft of hand-making decorative paper. Using fibers such as Kozo, Mitsumata and Gampi bush or tree to make the paper base, the paper is then decorated with dyes, foil and fibers to make the amazing, vibrant patterns seen here. 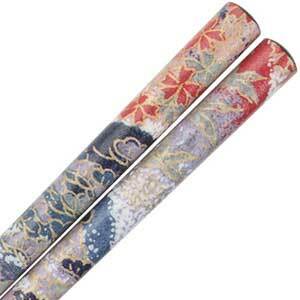 The Washi paper making craft is centered around Kyoto, close to Obama, Japan. 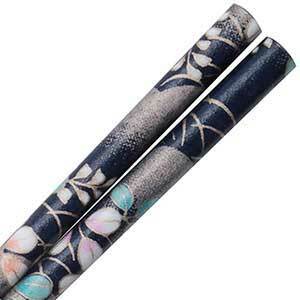 If you'd like to learn more about Japanese Washi paper chopsticks, read our article Japanese Chopstick Craft | All About Washi Japanese Chopsticks.